It’s world cruise time again, and P&O have got various ships in various far-flung places. Aurora, for instance, is doing a ‘grand voyage’ round Asia, and at the moment of writing is in the Indian Ocean, somewhere between Dubai and Mumbai. 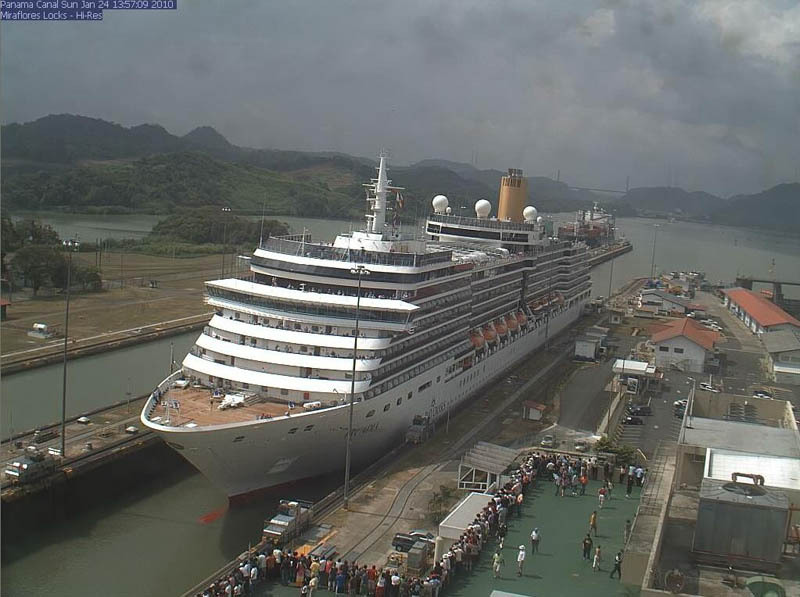 Arcadia on the other hand is doing a westbound circumnavigation, and yesterday she transited the Panama Canal. P&O very deliberately arranged Oriana’s partial transit – part-way through and then back – for the same day, so she could do the first part alongside Arcadia. 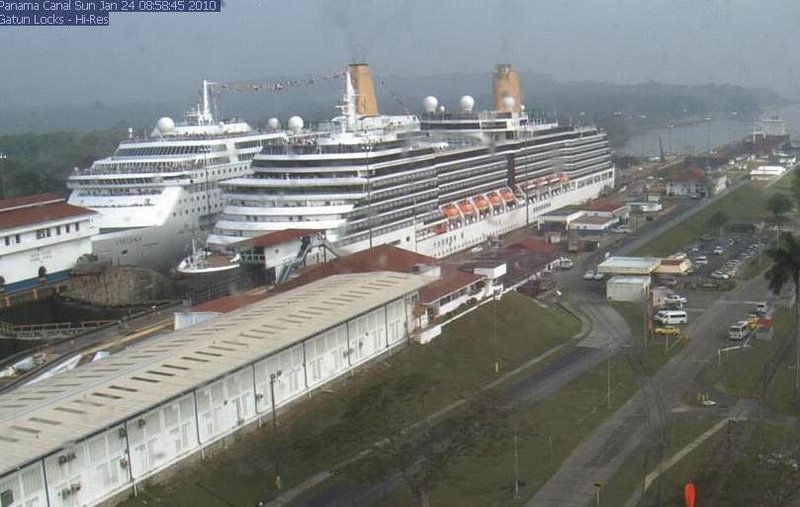 And that’s what the first image shows: Oriana and Arcadia side-by-side in Gatun locks, near the Atlantic Ocean end of the canal. (It’s a little know fact that the canal actually runs in the opposite direction from what you’d expect: when sailing westbound from the Atlantic to the Pacific, thanks to the geography of Panama the passage through the canal is actually in a slightly eastwards direction. The actual compass heading is SSE, I think.) The picture above comes from the Panama Canal webcams at the Gatun Locks, although they’re second-hand: someone who posts on the ‘Cruise Talk’ travelserver site captured a whole sequence, including webcam shots from onboard the ships, and posted them. Here’s the link to them. James Cusick, Executive Purser of Arcadia, is doing a blog of Arcadia’s world cruise. Follow the link to a lengthy entries about this ‘dual transit’, together with some more pictures including some from the decks of Arcadia. At some point Oriana must have turned round and Arcadia proceeded alone, and the second image show her on her own going through the Miraflores locks at the Pacific Ocean end of the canal. Oceana will also be doing a Panama Canal transit on the 29th, as part of her winter schedule of Caribbean cruises.